As one of the Kardashians’ fave artists, Rob Scheppy is a revered authority on contouring and all the camera-friendly tricks of the trade. Having been interviewed for tons of major magazines, Rob’s advice and know-how is the bee’s knees in the industry. This celeb-status artist is also an ambassador for Tweezerman, the go-to brand for brow tweezers, making him an impressive figure within his field. This past Spring, Rob was interviewed for Stylecaster.com, where he shared his wisdom on the art of contouring. According to Rob, one of the most under-valued contouring strategies is using the right brush tool. He recommends a high-performing brush with real hair. However, for those who prefer an animal-friendly option, he recommends to find brushes with soft synthetic hairs for a smooth application. 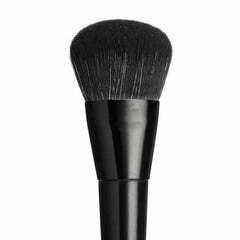 With the right brush, you can blend and diffuse the contour line more seamlessly. Rob also teaches us about the difference between night and day looks for contouring. For an everyday occasion, it’s better to keep the line more subtle, and go softer with the colours. For evening or trendier junctures, you can play with the level of depth you want to achieve. He notes how makeup can appear so different, yet remains consistent in its technique. As he explains, we see these differences through all types of people and places: “the girl that’s working at a bank all the way to the boy that’s a drag queen at night.” For Rob, it’s really all about letting your makeup represent you, whether that be for a specific occasion or simply showing off your personality. Given Rob’s celeb status and fantastic tips, it’s no surprise that he has over 380 k followers on Instagram. When browsing through his photos, you’ll see loads of unique yet random posts: whimsical moments, feel-good quotes and of course, snaps with Kendall and Kim. His page also includes images that reflect his personal light-hearted energy such as his recent picture of kiddy toys in Denmark. He also includes photos of inspiring art and famous architecture form around the world. Through these shots, it’s clear that Rob is a not merely just an artist, but a cultured trendsetter.